When you are immersed in a philosophy or a mindset, you internalize the messages whether intended or otherwise. Especially when you are a child with a limited understanding of complexities and nuances. We need to be so careful with the messages we send. I grew up in the Christian Fundamentalist movement in a series of small Baptist churches. And when I say I grew up in it, I mean I was in it. I was one of those kids who literally grew up in church. I was in Sunday School every week. My family was there on the third pew from the front every Sunday morning, Sunday evening, Wednesday evening, and for week-long (sometimes multiple week) Revival services several times a year. A week of VBS every summer, and sometimes extra weeks in friends’ churches. I went to Christian camps in the summer. Not only that, but I went to school at church. Yes. At church. I attended my church’s (very small) Christian school from pre-school to the middle of my tenth grade year, and then was home-schooled with the same Christian curriculum for the remainder of my high school years. Are you following me? I was in it. There were a lot of really great benefits to being raised that way. I memorized more Scripture in elementary school than probably 99% of Christians memorize in their whole lives. I was well-versed in doctrine and apologetics (according to my Fundamentalist churches’ beliefs.) I knew the Bible backward and forward. I came to Christ at six years old. I loved and was loved by a lot of wonderful people. However, there was one person I was not loved by, and that was me. In my Fundamentalist churches’ attempts to show me my sin and instill a reverence for the holiness of God, they inadvertently sent the message to my child’s heart that I was unlovable. In their efforts to teach me to put others first and love my neighbor, my child’s heart heard I didn’t deserve to be loved. Yes, I promise you they told me Jesus loved me and I promise you they wanted me to see God as a loving Father, but the intended message is not always the one received. I spent my entire childhood, my adolescence, and my early adulthood feeling deep inside that I was unworthy. I didn’t matter. I sat through church services where preachers told me that I did not deserve grace or mercy or love, but I deserved to be in Hell “with my back broke and my tongue cut out.” I’m not sure why that phrase was a thing, but it was one I heard a lot. Preachers seemed to try to outdo each other with descriptions of how unworthy we were of God’s love in an attempt to show us how gracious God is to love us despite our sin. The message I heard was that I was bad, unworthy, and unlovable. Little girls want to be cherished and loved. They want to feel special. Society is constantly telling them they don’t measure up. The church should be the loudest voice telling them they are adored. Even while trying my best to love God, I never viewed him as loving me. I stood up in church and testified of how I was so thankful for his love because I knew I didn’t deserve it, because that was what I was supposed to say. It was only a cognitive understanding, though. It never reached my heart. After a few years of personal upheaval in my life, I found myself very distant from God. When my church and ministry ties were broken, I found my relationship with God was not strong enough to keep me spiritually grounded. I went through a huge crisis of faith. A dark night of the soul. It was during this time that I started to really embrace a growing message from secular culture and the feminist movement in America. The message was that I was good enough just the way I was. I was beautiful. They were preaching self-love and body confidence. They were telling me I didn’t have to change who I was for any man or anyone or any prevalent idea of beauty. They said black is beautiful. White is beautiful. Brown is beautiful and special and lovely. They said girls are smart. Girls are talented. Girls can change the world. They told me I was worthy of love and respect. I should have heard that at church. Instead of embracing the idea of being fearfully and wonderfully made in church, I embraced a more humanistic message. It was an improvement over the way I had always saw myself, but it wasn’t quite enough. Three years ago, I met a man who made me his wife, and he has poured sweet words of affirmation all over me since day one. When we were first dating, I started going to church with him because I hadn’t been able to find a church that was the right fit for me and my kids up to that point. I wasn’t sure I liked the church at first, when I was just dipping my toes in the water. But the further I waded in . . . into small groups and Women’s Bible studies . . . the more I realized this church was just what I needed in my life. They were preaching a different message. They told me I was loved, adored and cherished. They told me they had tarnished pasts and damaged histories. They told me that this church was a place it was okay to not be okay. They told me I was loved. Week after week the pastors, the worship leaders, the small group leaders stood before me and said, “We love you so much!” It was a different vibe. It was such a relief! I’ve been getting more and more involved with this church, and I’ve recently began serving in the student ministry. As I have sat in church with hundreds of middle school and high school students listening to sermons geared toward them, I have found that my inner child . . . the little girl and the teenager and the young adult I used to be . . . is listening, too. She’s hearing words she never heard before, and it’s changing the woman I am now. Last week, the student pastor told that room full of students that they needed to love themselves. He told them they needed to love God above all and then they needed to love themselves. He told them they cannot love others the way others need to be loved if they don’t first love themselves as the beloved sons and daughters of God. It rocked me. As he read Scripture and taught about relationships, I sat there stunned realizing I had never heard that message in church before. I realized self-love does not have to be prideful. I realized it is not at odds with the Bible or Christianity. Jesus taught us to love God above all and then to love our neighbors as ourselves with the implied assumption that we would love ourselves first. So if you’ve not heard that message before, let me be the first to tell you . . .
You are loved by God with a fierceness that will take your breath away if you ever grasp it. You are worth so much. Despite your mistakes, your missteps, and your sin, Jesus came to take all that from you and restore you to relationship with God. He wants you to understand how much He adores you. Jesus wants you to know that you are wonderfully made. You are a work of art . . . the special passion project of the Creator. 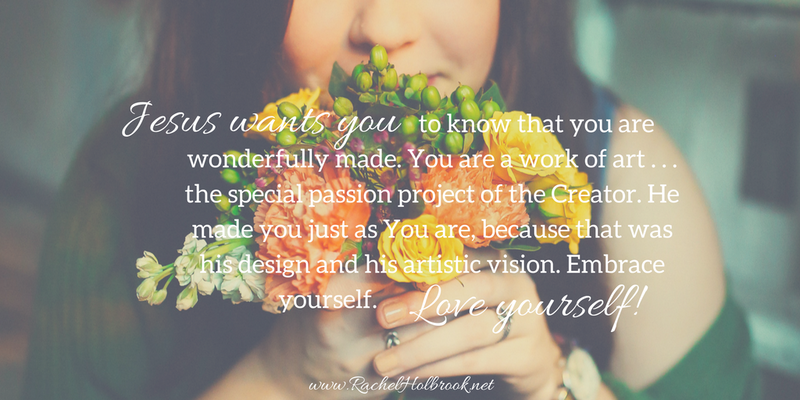 He made you just as You are, because that was his design and his artistic vision. Embrace yourself. Love yourself. You will be surprised at how much love you have to pour out to others when you let yourself be immersed in the love He wants to pour out all over you. ~If you have questions or want to know more, send me a message through my contact form. I’d love to talk to you. This entry was posted in faith, Self-Love. Bookmark the permalink. As a father of a young girl, reading this is eye opening. I sigh as i read this. I was 8yrs old and all i wanted to do was die. I wrote it everywhere. Yes i was loved by the extended family but not loved the way a little girl should be. Im a mother myself now and i try so hard with my kids but that 8 year old still lives in me. Ps im happy that your story ends well.